It’s almost time for the biggest game day of the year in my house…the Super Bowl! You better believe I will be cooking up some yummy eats. 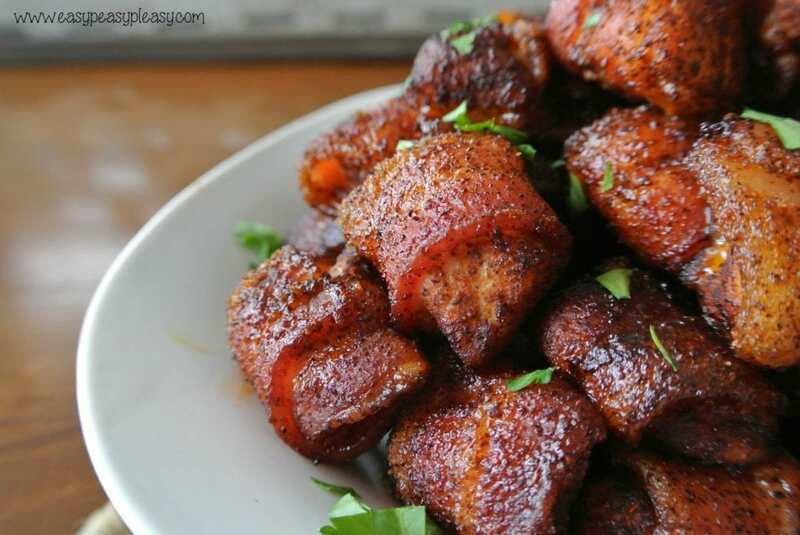 One of my all time favorite appetizers to make is Sweet Chicken Bacon Wraps! This one is a definite crowd pleaser. There are only 4 ingredients and one of them is bacon. How could you not want to give these bad boys a try? This is one of those types of recipes, when you make it for people, they will all want to know how! I remember coming across this recipe for Sweet Chicken Bacon Wraps years ago and making these for the first time to take to a friends gathering. (Around here, you never go empty handed and it’s usually food in those hands.) I hoped they would turn out good since I had never tried them before. They were better than good! 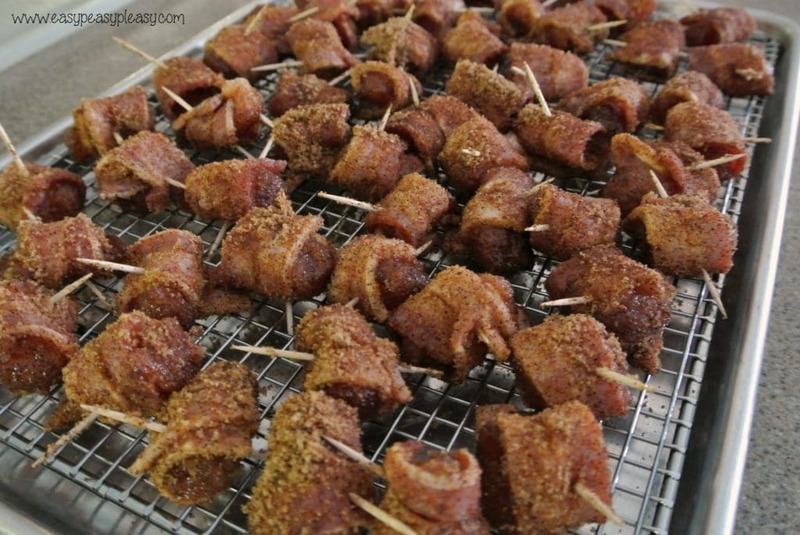 So good in fact, now everyone in my family and my friends make these little chicken bacon bites of heaven. First, let me tell you about my method for easy assembly. I cut the whole package of bacon in thirds. I count how many bacon slices there are and I count how many chicken tenderloins are in the package. Then I holler at my husband to do the math. I ask him to tell me how many cuts I need get out of the chicken to have the exact amount needed for the bacon. For some reason when my hands are covered in bacon and chicken, my brain just doesn’t work correctly, or better yet the calculator on my phone isn’t accessible…lol! It usually equals out to 6 or 7 pieces from each tenderloin. Once all of your chicken has been wrapped in bacon, it’s now time for the dredge. Drop them in a bowl of your seasoning mixture and roll around until well coated. Finally place on the pan and your ready to bake! I have also made these Sweet Chicken Bacon Wraps ahead of time without baking. Just store in the fridge until you are ready to party. Then throw on pan and bake. Now let’s get to this easy recipe! Preheat oven to 350 degrees. 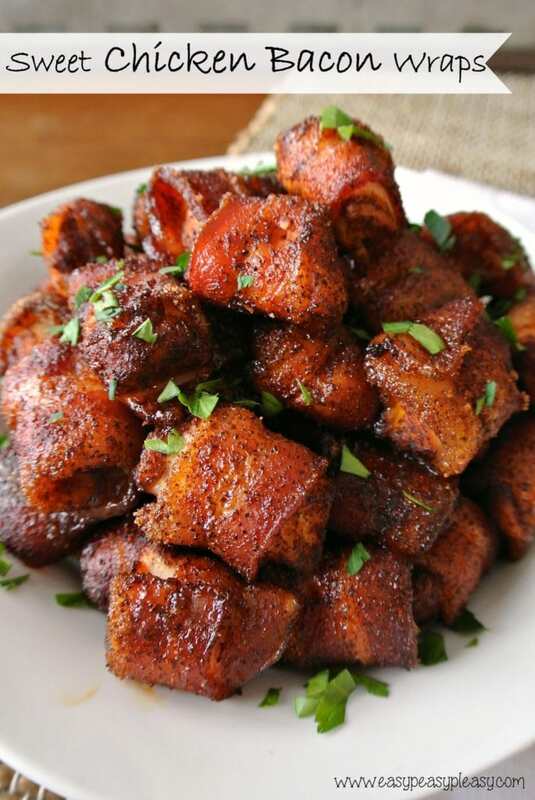 In a bowl, mix brown sugar and chili powder until well combined. Set aside. Place a baking rack on your cookie sheet and get your toothpicks ready. Remove the bacon from the package and cut the whole stack into thirds. Now cut your chicken breast tenderloins into small pieces equaling the amount of bacon slices you have. Keep the cuts all the same size for even cooking. 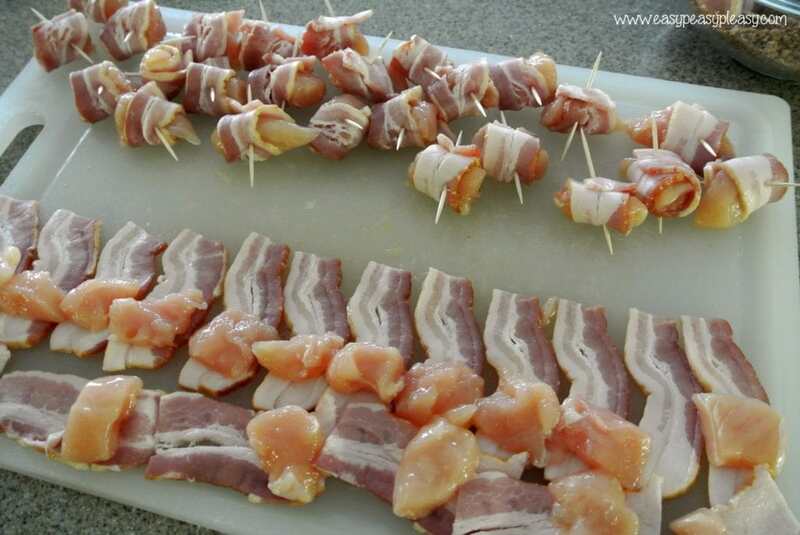 Wrap each piece of chicken with a slice of bacon and secure with a toothpick. 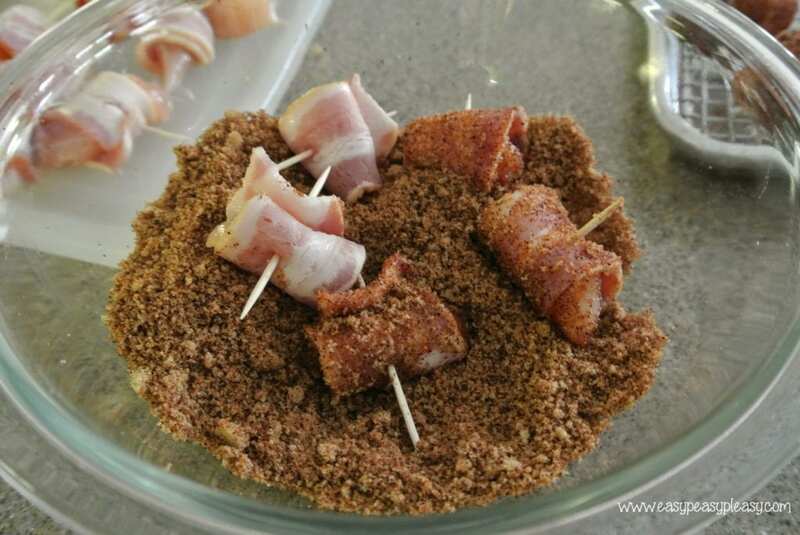 Dredge the bacon wrapped chicken into your brown sugar mixture. Place on your baking rack and cook for 30 to 35 minutes. Eat and enjoy!!! That is all there is to this easy Sweet Chicken Bacon Wraps recipe! Make sure and try one when you put these out for your friends and family to eat. If you don’t, there probably won’t be any left for you to try later. If you are looking for some other delicious game day food ideas, I’ve go you covered! Check out these Mini Seven Layer Dip Football Bowls here. OMG! They are so cute and delicious! 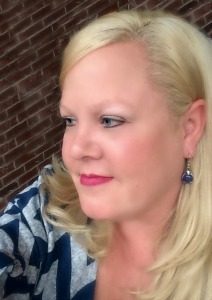 Love the taste of jalapeno poppers but not all the work? You can find my Ranch Jalapeno Popper Dip here. It’s fabulous!! One of my most pinned recipes on Pinterest is my 4 Ingredient Cheese Ball. This is another one that my friends always ask me for the recipe. Are you in need of some fun decorating ideas? You can find inspiration and directions here. What are your easy go to football party foods? I can’t wait to hear from you! To get all things Easy Peasy Sent right to your inbox! Wow these turned out great what a great recipe for the upcoming Super Bowl parties! Thanks for linking up to Merry Monday! Sharing on my Football Recipe Board! Have a great week! Thanks Kim! I appreciate that and I’m glad you liked them! WOW! Just know once you make these everyone will demand you bring these morsels of goodness to every get together. In fact we don’t even wait for get togethers we have for a regular meal. They are so delicious! Lacie thanks for introducing these to us! Thank you Deb! I’m so glad you like them!! !